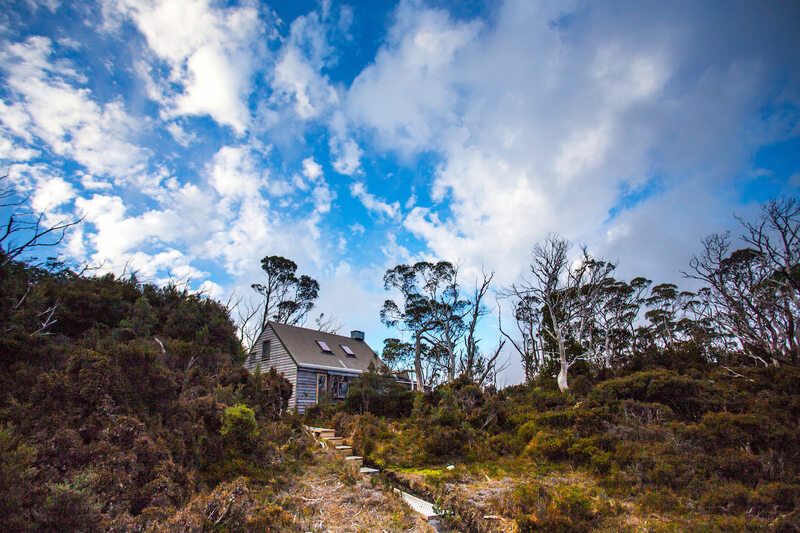 Following the famous Overland Track within Tasmania's World Heritage Area, the Cradle Mountain Huts six day walk is a fabulous journey extending from Cradle Valley to Lake St Clair through a variety of spectacular landscapes. This extraordinary World Heritage Area features a huge diversity of flora and fauna; wombats, echidnas, wallabies and Tasmanian devils (to name a few) make their homes amidst the rainforests, glacial lakes and craggy peaks. After each day of walking, retreat to the exclusive and private huts, nestled away just off the track. 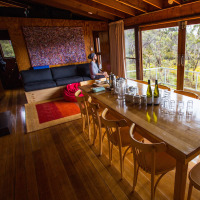 Each ecologically sustainable hut is a haven featuring hot showers, pot belly heater and comfortable twin share rooms. A hearty three-course dinner prepared by your guides, accompanied by fine Tasmanian wine offers the perfect end to each day. 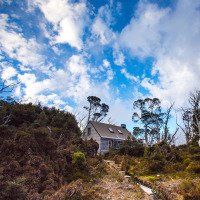 Cradle Mountain Huts Walk offers the only private hut accommodation along the Overland Track. Each hut is tucked away off the main trail and offers a hot shower, drying room and twin share accommodation. There are games and books in each hut, which can be enjoyed by the pot belly heater in the lounge, or in warm weather, out on the deck. The architecturally designed huts are designed and operated to have as minimal an impact on the surrounding environment as possible, using renewable energy, rain water tanks and self composting toilets. The six day walks depart daily from 1 October to 1 May. Meet your tour guides and fellow guests at Quamby Estate in Hagley at 7.15am (please let us know if you would like us to arrange your pre tour accommodation at Quamby Estate). Alternatively, you may be collected at The Sebel in Launceston at 6.40am. Guides will complete a gear check before we depart on the journey to Waldheim in Cradle Valley. Set off on the first day's walk at 11am, through ancient temperate rainforest and past the dramatic Crater Lake. After completing the steepest section of the track (mostly stepped, taking around 1 hour), we reach Marion's Lookout which, weather permitting, offers breathtaking views of Cradle Mountain with Dove Lake at its base. Lunch is enjoyed by the tranquil Plateau Creek before continuing on for another 4 hours around the base of Cradle Mountain, out along the edge of a spectacular glacial cirque then dropping into Waterfall Valley which we cross before arriving at our hut at the base of the towering Barn Bluff. 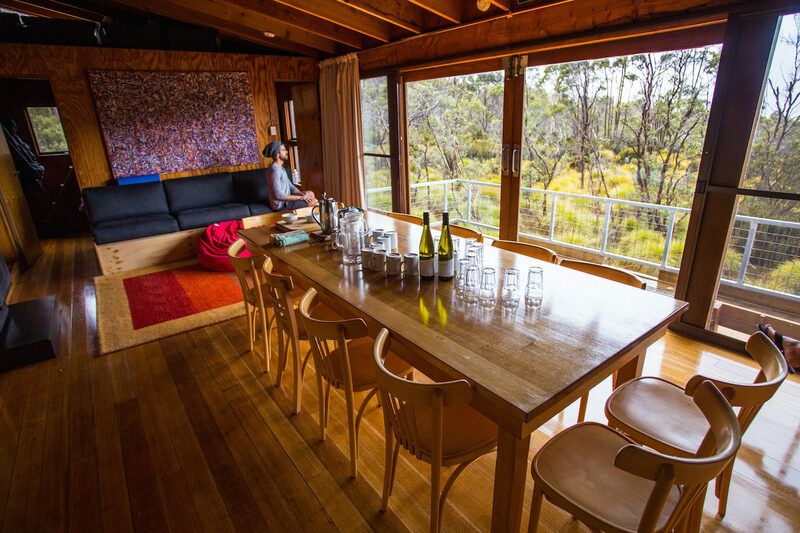 Relax in the company of your fellow hikers, enjoying a three-course dinner and a nice glass of Tasmanian wine. A day of undulated walking with a few sections of exposed moorland. There are no large hills and there is now a duckboard path over the muddy Pine Forest Moor. Travel across plains where glaciers once moved and where there are now plains of button grass and ancient pencil pines. The peaks of Cradle Mountain and Barn Bluff are now behind us and the stately Mt Pelion West is directly ahead. There is an optional side trip to Lake Will. Today's walk begins with a descent around the base of Mount Pelion West and down to the Forth River before it plunges into the Lemonthyme Valley. After a break at Frog Flats there is a long, gentle ascent out of the valley onto the beautiful Pelion Plains, with spectacular views of Mount Oakleigh. With mountains all around, wonderful swimming holes and abandoned copper mines, the Pelion Plains area offers plenty of side trips, as well as many peaceful spots for taking a well earned rest. Today is a very relaxing day, with the option to make it more challenging with a side trip to Mt Ossa. We begin with a climb to Pelion Gap. From here there is extra time allowed for some optional side trips. Continue on a gentle descent over a few hours to the hut. Depart the hut and walk to Du Cane, about an hour, where there is a hut remaining from the long-gone days of animal trapping. We then wander through some of the oldest forest in the national park, with King Billy pines as old as 2000 years. Visit at least one of the three major sets of waterfalls on the Mersey River, which descends deeply towards the Bass Strait. We will likely enjoy our lunch beside one of these falls. In the afternoon we make our way over Du Cane Gap before descending beside the spectacular Falling Mountain to Windy Ridge Hut. Our final destination, Lake St Clair, is Australia's deepest natural lake. Today's walk is mainly through cool temperate eucalpyt forest, with birdsong all around. We arrive at Narcissus at the northern end of the lake in time for lunch. Board the Idaclair cruise boat for a spectacular 17km cruise back to Cynthia Bay, where there is time to look around the visitor's centre. We then drive through the highland lakes, descending the rugged Western Tiers to the broad plains of the northern Midlands on the return trip to Quamby Estate. Head east today, crossing Pelion Plains and following the shores of Lake Ayr, wandering through eucalypt forests and across button grass plains. We then follow a gradual incline along the Innes Track before having lunch at Wurregarra Creek. From here, Mount Pillinger and the peaks along the Overland Track dominate the view. After lunch we pass Lake Price before beginning the sharp descent into the Arm River Valley where we meet our shuttle bus for the return to Quamby Estate via Mole Creek Karst National Park. All accommodation is twin share. Single travellers may be required to share a room with another walker. To guarantee a single room for the duration of the walk, a supplementary price of 75% of the full fee will apply. This must be requested at the time of booking. Tours operate between 1 October and 1 May. As long as you exercise regularly, are capable of walking an average of 10 km for six consecutive days, and are comfortable with varied terrain, you’ll be fine! There are obviously steep sections, however this is part of the whole experience. Each day, there is plenty of time to sit and rest as well as explore, so you won’t feel rushed. If you are interested in doing more of the side trips (such as Mt Ossa), you may want to partake in extra training to accommodate the additional challenge.